Gremo Maskinservice AB is an independent service partner within the forestry, agricultural and construction sectors. "Since the 1960s, we have serviced and repaired thousands of forestry machines for Gremo, a leading manufacturer of forestry harvesters and forwarders, which has given us extensive experience, and the capacity to extend our business in relevant markets", says sales manager Emil Tellvik. Gremo Maskinservice currently offer repairs, spare parts, accessories and servicing to large and small contracting enterprises, agricultural and forestry businesses with excavators, tractors and forestry machines of the majority of makes on the market. 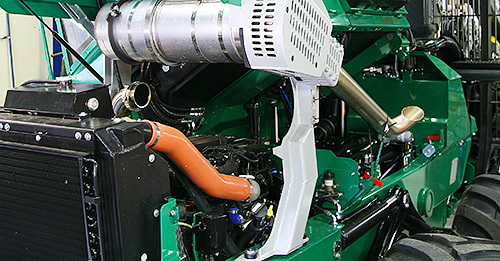 Gremo Maskinservice also offers used machine parts, spare parts and accessories for forestry machinery. Repair and servicing of forestry, agricultural and construction machinery. Used machine parts, spare parts and accessories for forestry machinery. Starting in October, Gremo has initiated a collaboration with the freight company Danx and their In-Night distribution. We are currently offering a special deal on selected products from our collection of clothing. Gremo makes a big investment for the future. Satisfy the new requirements when there is a risk of fire. Meet us at the fair and hear how Gremo's forwarders fits all kinds of forest clearing. From Monday 20 March, we will establish a hotline number for spare parts. Gremo strengthens its workforce with three new employees. The company's after-sales market has been reinforced by two employees and a new employee to the purchasing department. Gremo will strengthen its position as a supplier of forest thinning machines. We will produce effective and supple machines with focus on low ground pressure. Don't miss our Christmas offers. Opening hours during the summer! Information about manning during the holidays at Gremo. Welcome to the International Forestry Fair Rogow, Poland 2013, 4-6 September! Spare parts closed on April 30 and May 18!